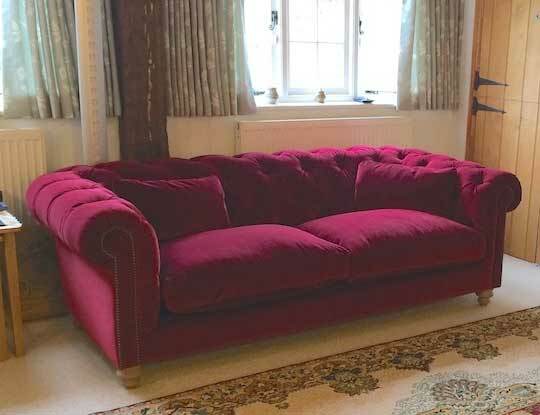 Handmade British purple sofas, made to order in absolutely any fabric in the world. Whether you call it amethyst, lilac, mauve or violet, a luxurious purple sofa is the ultimate item for glamorous interiors. Imagine your home with the addition of a purple chesterfield sofa with regal appeal, or perhaps a perfectly practical aubergine sofa bed for surprise stopovers. Squashy purple corner sofas are just the ticket for family time or choose a purple armchair if you fancy just a splash of colour. Whether you’re looking for contemporary sofas or a more traditional style, there is a shade of purple sofa to suit all interior tastes. Any of our bespoke, British sofas can be covered in your favourite tone, with lots of inspiration to design your very own purple sofa both in our showrooms and online. When you think of purple sofas, you may well think of that scene from the Austin Powers movie, but you may perhaps be surprised to know that purple sofas are right on trend this year. S&S have seen a large increase in quotes and orders for purple fabrics over recent years. 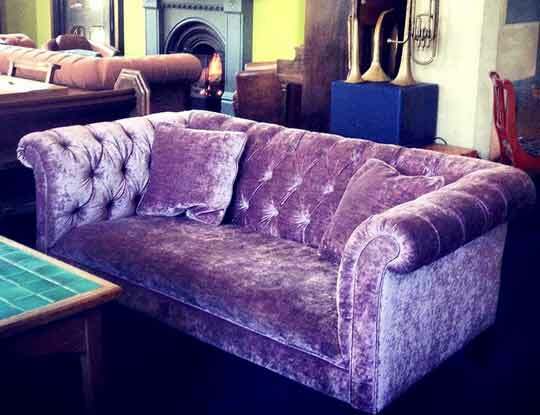 Some of our most popular products are purple velvet sofas, upholstered on modern or even classic sofa styles. If you need something a little more tailored and want to create a truely bespoke sofa. Why not pop into one of our 12 sofa stores and speak to an interior design consultants. They are fully trained and always offer expert advice on creating not only the perfect settee for your needs, but will assist you in choosing the right colour and fabrics to suit your lifestyle. Be sure to check out our clearance page, where you could find anything from a 3 seater purple sofa, to a large purple corner couch for the those growing families. Why not order some free purple fabric samples pack, so you can see the high quality fabrics we offer.